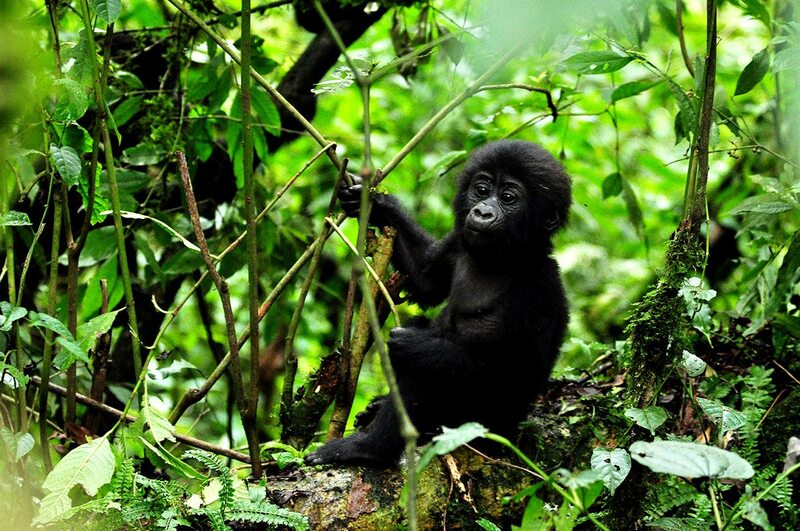 For the safari of a lifetime, go Uganda gorilla trekking in Bwindi Impenetrable Forest, a national park in the southwest of the country. 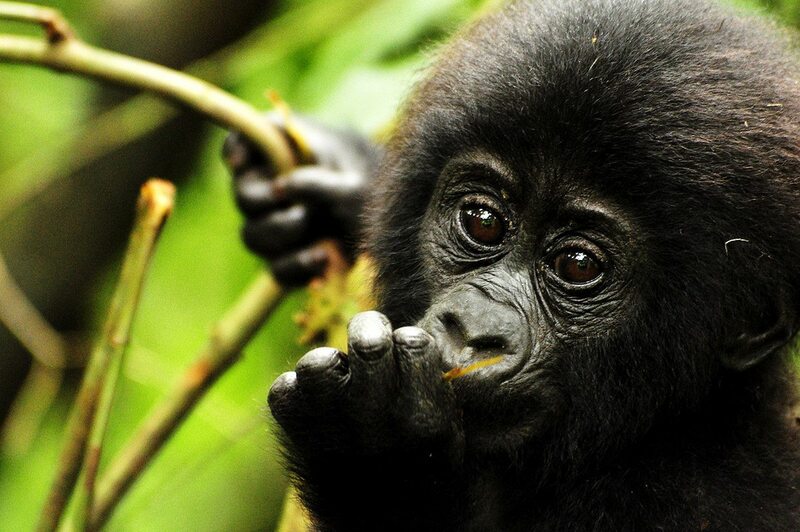 It’s home to more than half of the world’s surviving population of endangered mountain gorillas. 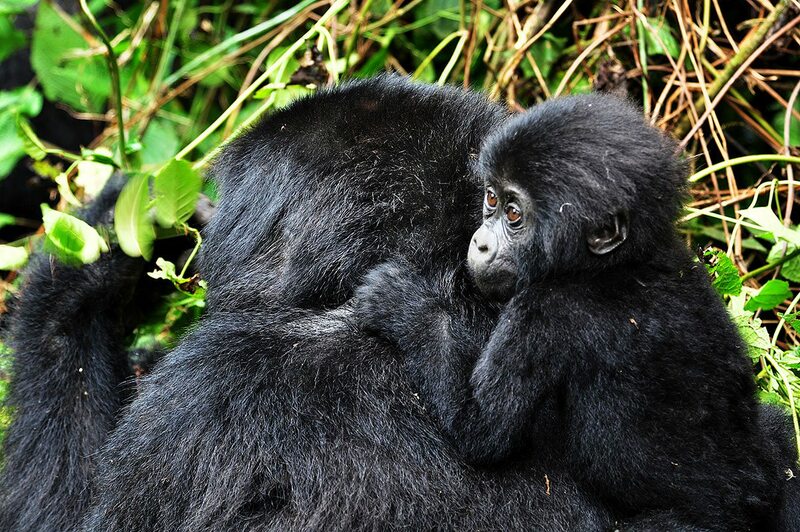 An encounter with these gentle Uganda gorillas is sure to make a profound, even life-changing, impression. 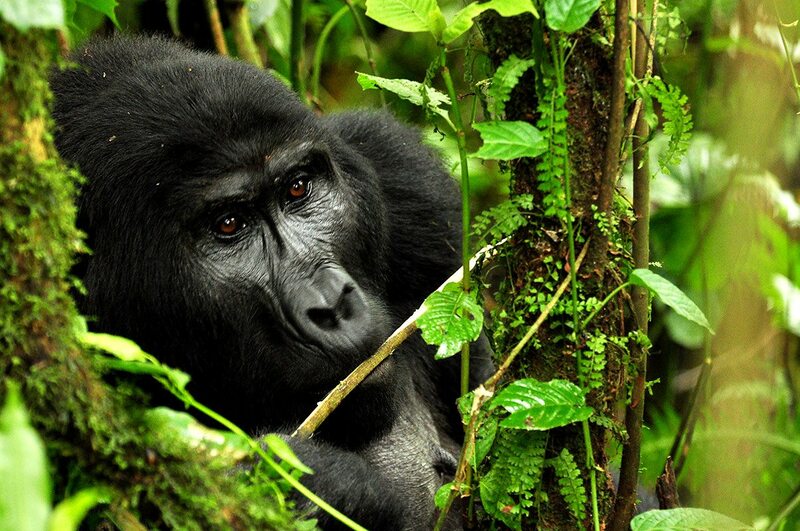 We had come to Bwindi Impenetrable National Park in southwestern Uganda to experience the thrill of gorilla trekking. For my partner and I, it was the journey of a lifetime. 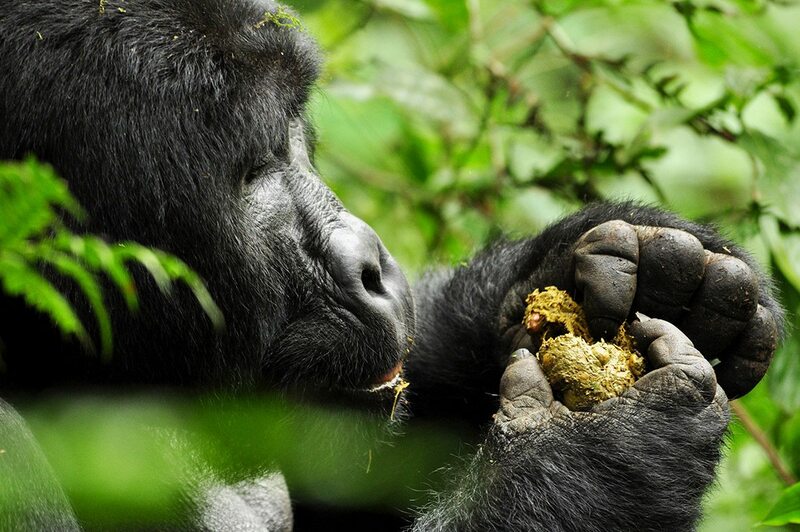 The ancient rain forest of Bwindi extends over a series of steep ridges in the midst of the volcanic Virunga mountain range. This area has been declared a Unesco World Heritage site due to its ecological uniqueness and natural beauty. 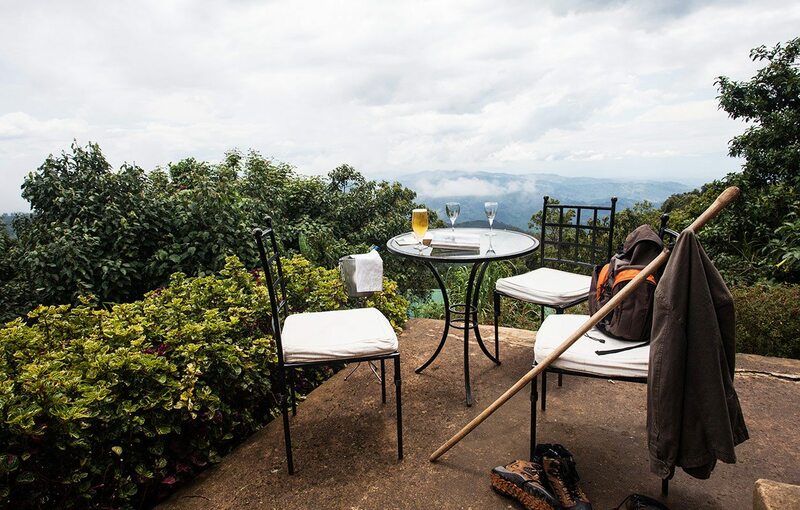 Our luxury lodge occupied a spectacular setting surrounded by dreamy, mist-covered hills. 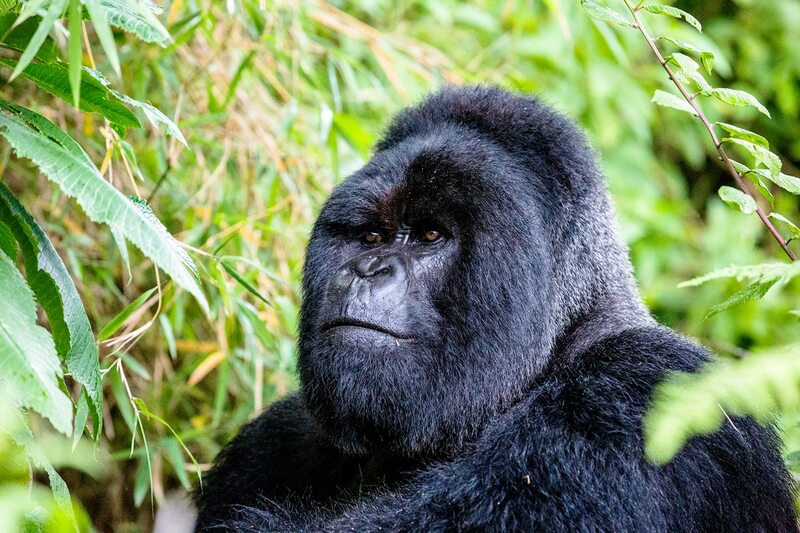 The ‘impenetrable’ forest that surrounded us protects more than 300 mountain gorillas – roughly half of the world’s population. We were woken early in our lavish tent by the twitter of birds, and I gazed out over the forest canopy below. My partner and I dressed in long-sleeved shirts and trousers (for jungle walking). Boots and rain jacket on, we were good to go. Our little group set off with Dembe leading, accompanied by three armed escorts and a porter. The forest’s impenetrable nature soon became apparent. It’s dense with thickets, vines and bamboo forests. 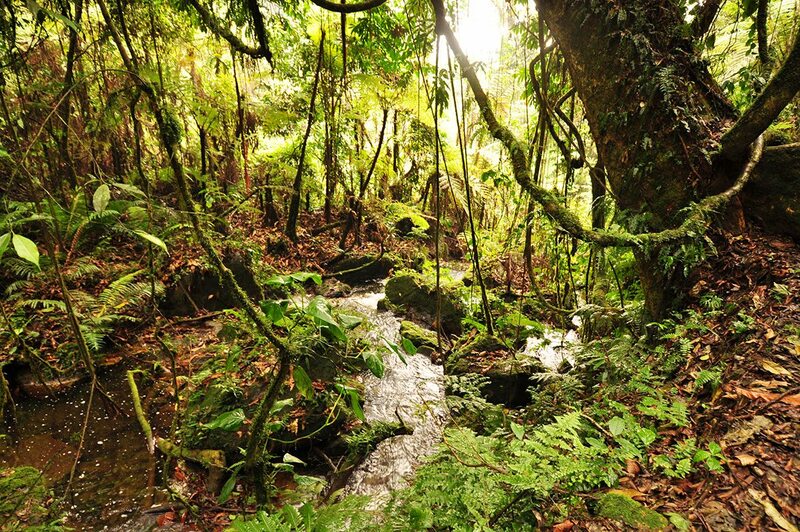 Following in the steps of our nimble guide, the rainforest unfolded magically around us. Occasionally we’d stop to catch our breaths, have a drink of water and take it all in: the sounds, smells and astonishing scenery resplendent in a myriad of greens. Upward and onward we trudged. 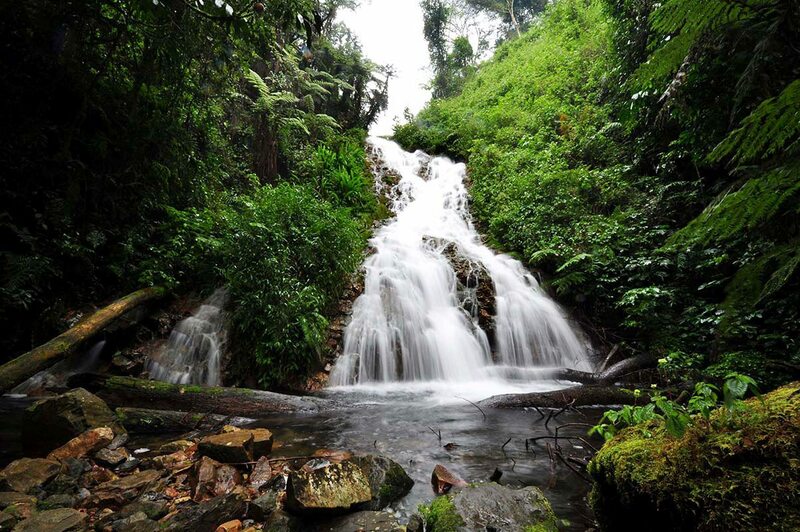 At times, the going was rough, with steep slopes covered in dense foliage and the ground muddy underfoot. 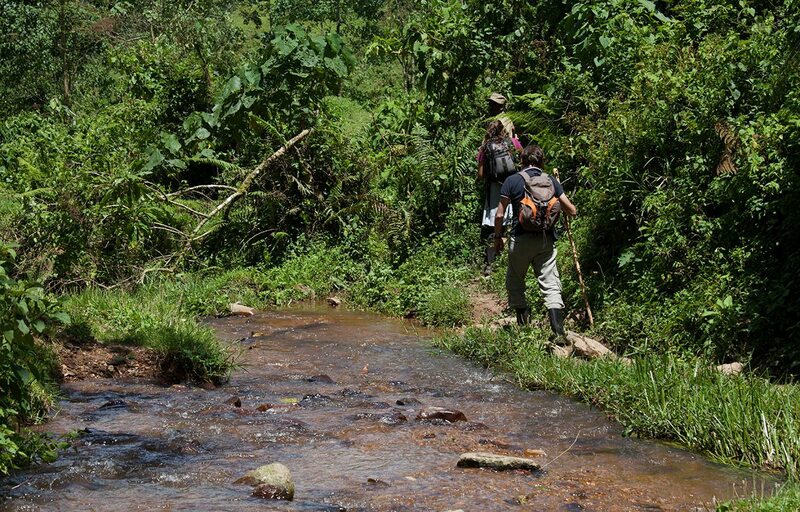 I was sweating profusely as we slogged our way deeper into Bwindi. 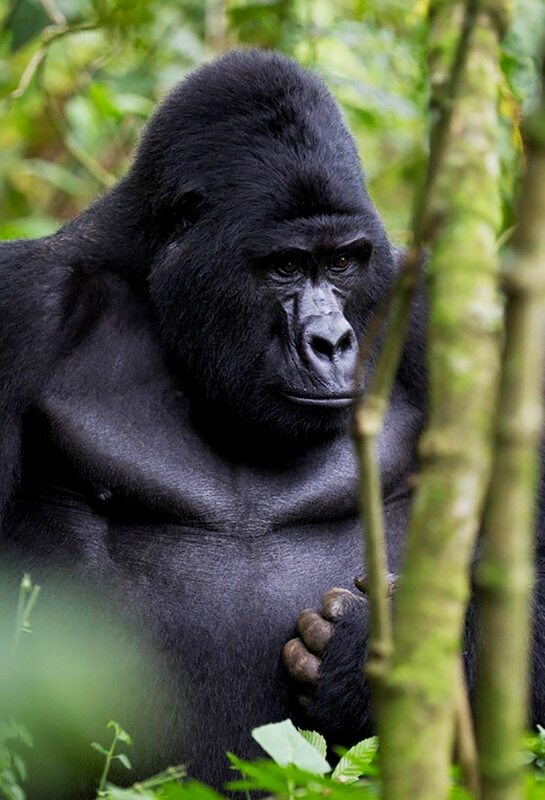 Suddenly, in the middle of a stand of bamboo, we happened upon a family of gorillas: a large silverback, six females and five babies. We were spellbound. I started taking photos, my Nikon clicking away noisily. 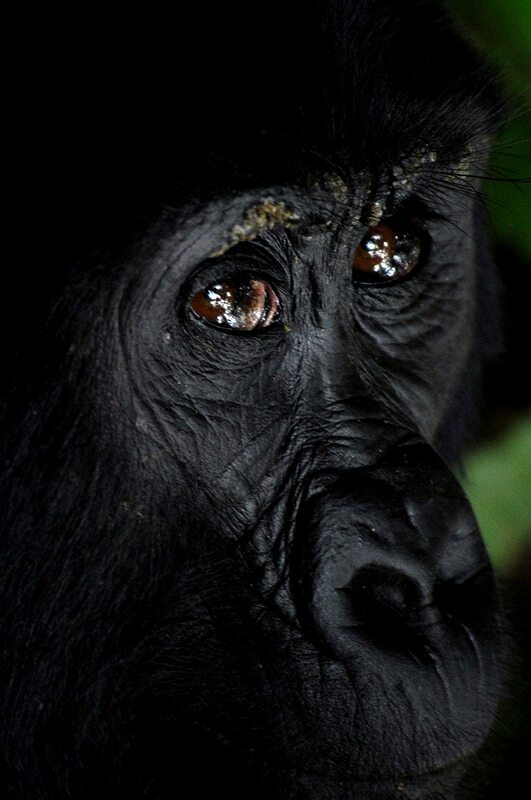 The male gorilla turned from his meal of bamboo shoots and glared at me. He was a monster, three times bigger than an average man. His eyes, soft amber, bored into me as if asking a thousand questions, or maybe just the big question separating the two of us. 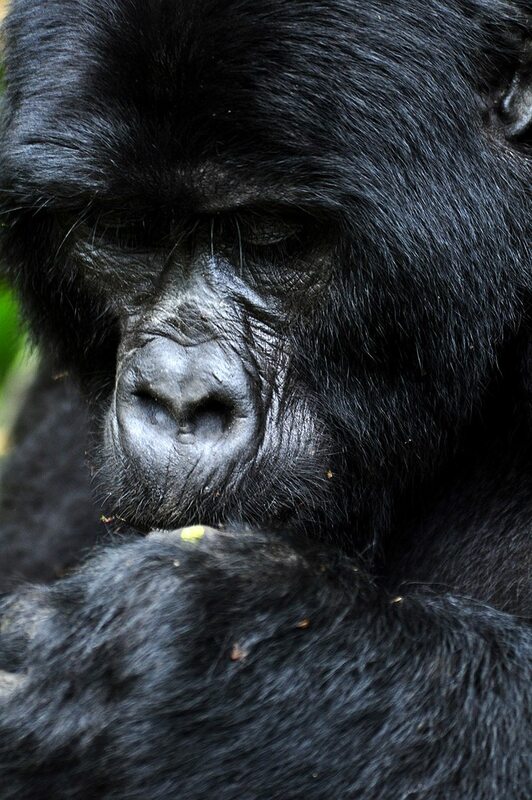 The silverback brushed past me, heading for two baby gorillas that had wandered behind us. My heart was pounding, but my whole being was elated. I’d been touched by a big, hairy angel! The young ’uns were gambolling about like animated balls of fluff, unconcerned by the bipedal apes in their midst. They’d climb a bamboo shoot until it bent to breaking point, sending them tumbling to earth. 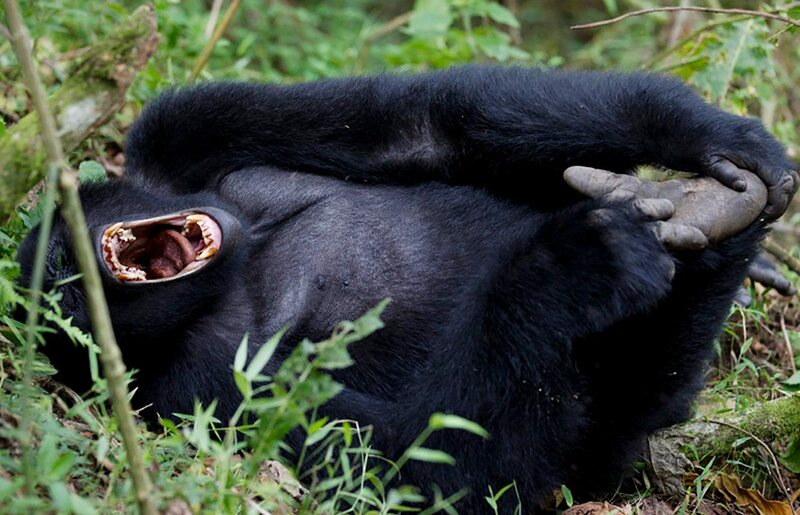 My partner stifled a giggle as the silverback glared at us. 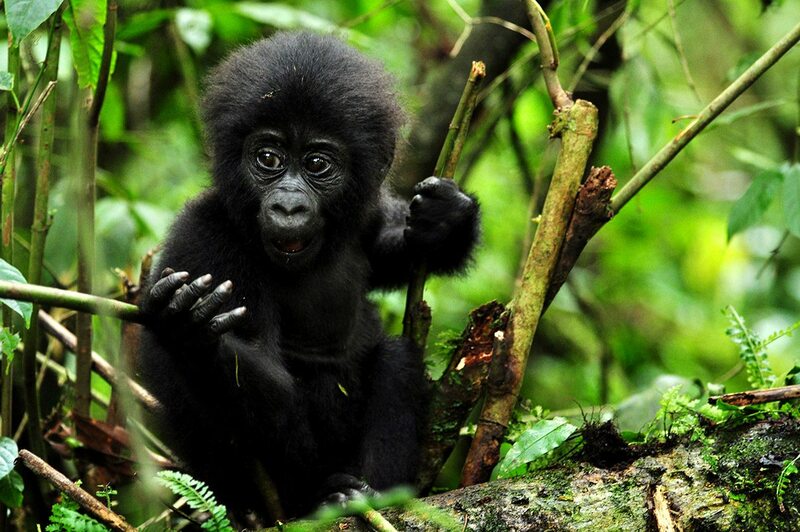 One of the babies approached us, raised himself up on his hind legs and beat his chest, imitating daddy. The ‘oohs’ and ‘ahs’ from our group were not exactly the reaction he’d hoped for. He slouched off in a huff. After the shortest hour of our lives, we were led back down the mountain, slipping, sliding, caked in mud and utterly elated. That evening we sunk into a comfortable couch in front of a crackling fire and recounted every aspect of an experience that had profoundly touched both of us. 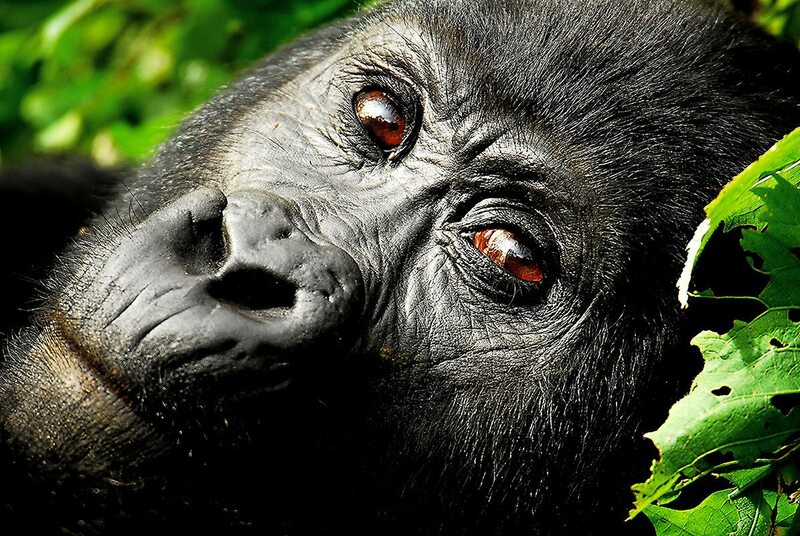 The silverback is named for the silvery grey hairs that grow when the male matures. 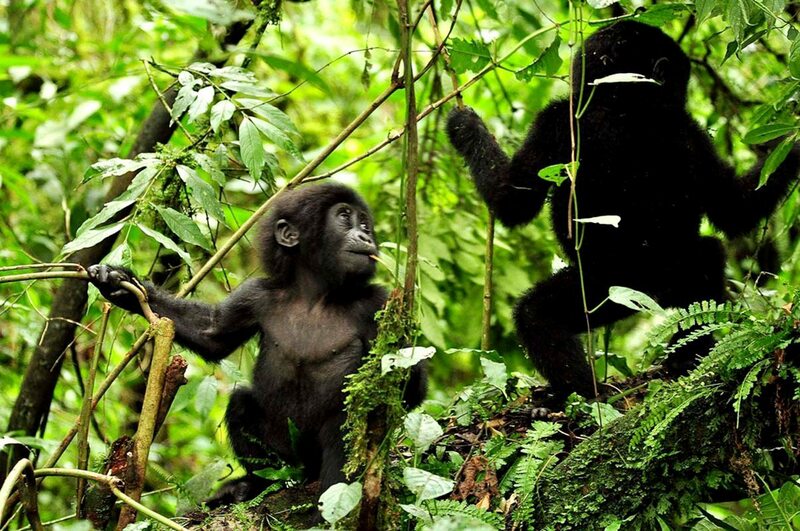 While chimp trekking and gorilla trekking are the two stand-out activities on this Uganda luxury safari itinerary, they’re by no means the only reason to visit Queen Elizabeth Park and Bwindi. The contrast between misty mountain forests and the rolling plains underlines the variety of landscapes and wildlife on display. 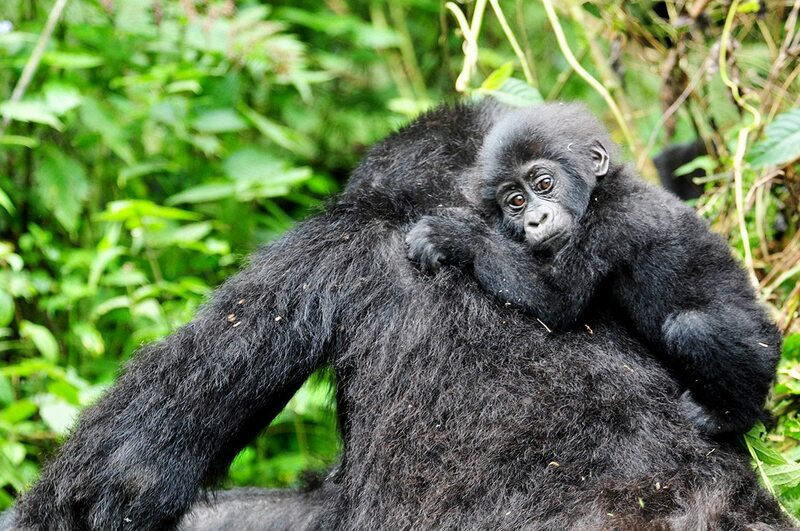 Bwindi Lodge combines the primaeval and the modern in studied harmony. The nearby forest has a timeless quality to it, with its ancient trees, mist and mystery. The transition from the forest into this luxury Uganda safari lodge brings you into a world of comfort and locally appropriate style. 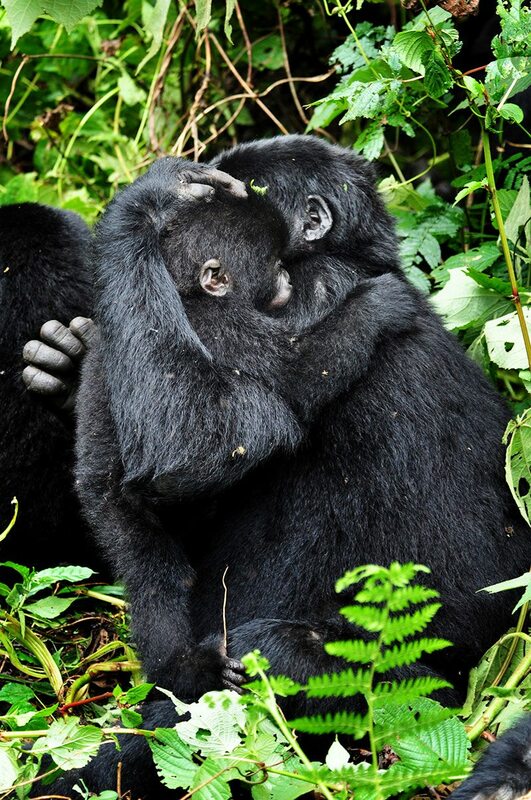 Deep inside Bwindi Impenetrable Forest, Sanctuary Gorilla Forest Camp is the perfect base for gorilla safaris, and the gorilla families even periodically pass through! 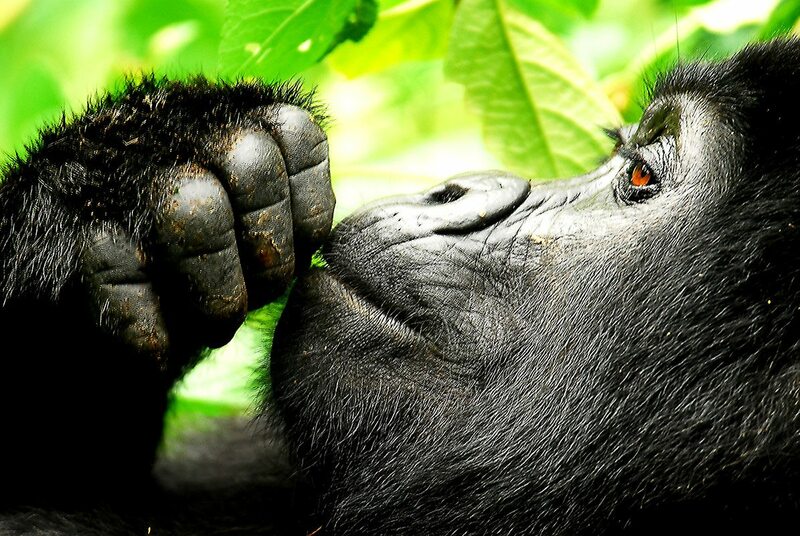 Discover diverse mammals, birdlife and butterflies, enjoy a Big Five safari, or relax around the campfire with a G&T at this luxury Uganda safari lodge.